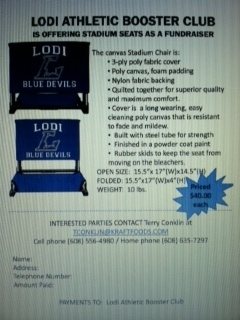 Fundraising & Merchandise - Lodi Athletic Booster Club, Inc.
- Quilted togther for superior quality and maximum comfort. - Cover is a long wearing, easy cleaning poly canvas that is resistant to fade and mildew. Donations to the Lodi Athletic Booster Club, Inc. are tax deductible as allowed by IRS rules. Show your Lodi Blue Devil Team Spirit - Our items for sale range from adult to children's apparel and accessories at Associated Bank in downtown Lodi or a limited selection at the various sporting events. If you have any questions, please contact Tracy Sachtjen at 608-628-4425. All proceeds go to support Lodi High School Athletics.